This category is for information which is inspiring to us and we hope to others. I can say with full confidence that I was no athlete when I was a kid. My first memory of playing a competitive game of sports was playing punch ball in the school yard during gym class. I was probably in first grade. I bounced the ball and hit the darned thing so hard. I couldn’t even believe I made contact the first time. The ball went flying. All I could think was, “RUN!” So I did. I ran lightening fast, well at least it seemed that way to me. Everyone was yelling and cheering me on! It was a beautiful moment. The wind whipped my long hair around my head, blurring my vision. I rounded the bases and ran back to home plate. But like in the movies, when I looked up, everyone was staring at me, mouth agape. What happened? Weren’t they all just cheering? I was sure I had scored the winning run! Turns out everyone was in a state of shock. Instead of running toward first base, I had run toward third and moreover, I had hit a pop up and everyone was yelling at me to get the heck off the field. I was totally out of breath, exhausted and humiliated. I was overweight and was already the default-last-kid-picked. Now, this incident sealed my fate. I certainly wasn’t going to ever put myself out there again and commit another sports faux pas. And what’s up with running anyway? It just makes you tired, I thought. You know when you are at a workshop and doing the team building thing and the leader, who clearly is the devil in disguise, very sweetly asks the group to share their most embarrassing moment? I don’t even share this story. Let’s face it. It’s just too embarrassing. Yes, I even saw you cringe when you were reading it. So you may wonder, why would I share my most, deepest, darkest, embarrassing moment with you? Well, it is part of the story of how I became a runner and you may have one of those stories gathering dust in your own closet. I think a good airing of those old stories once in awhile puts things into perspective. About 4 years ago, I recalled my punch ball story when two very dear friends made a suggestion to me that I join them and register for a race. I immediately said, “I’m not a runner. I have never been able to run. I get out of breath. I have no stamina. I can’t run.” The race they wanted me to register for was called Beauty and the Beach. The Beauty race is a five mile women’s run. I said, “Five miles? I can’t even run a mile how can you possibly expect me to run five miles? !” As I said that out loud, I thought, “Hey, wait a second, I don’t know if I can run a mile; I never tried. Perhaps, what if I could run a mile?” My friends kept telling me if I train, I can do it. Yes, this is the running version of the famous quote, “if you build it, they will come,” from the “Field of Dreams” film. I mulled over the thought of training for the race and tried to not automatically dismiss that I couldn’t do it. Training is like suspending your belief system for a while. It is going to take a very long time to actually get the mileage under your belt. You cannot prove that you can do it, but cannot prove that you can’t either, at least not at the beginning. It was crazy to me to train because it wasn’t a sure bet that I could eventually even do it. I was going to put a lot of effort into something and didn’t know if I would hit my goal. Along the way a running coach said to me, “Trust the process.” So that became my mantra, and quite frankly I still use it. So initially I thought I had to transform my body first and then I would be able to run. But, what I really learned along the way was that I had to transform my mind. I had to just allow myself to get uncomfortable physically and emotionally with the process. There is no growth without feeling uncomfortable. Of course, I never want to feel as uncomfortable as I did when I was a kid in the punch ball situation, but if I survived that, I could survive training for a race. So while I was training for Beauty, I set a goal to run the Little Silver 5k during my training. I was so nervous the day of the 5k race; I was uncomfortable and felt out of my element. But running that 5k gave me a confidence booster and made me feel excited to continue training for Beauty. After I crossed the finish line on a beautiful windy November morning down in Long Branch to cheering groups of women the day of Beauty, I was filled with heady excitement and I wondered what I should do next? Did I really want to keep running? There was a buzz that day among the runners about the Long Branch Half in a few months. I was drunk on my accomplishment, as most runners are after a race, so I registered as soon as I could! Of course, a few days later remorse set in. What the heck was I thinking? A half marathon is 13.1 miles! But, I remembered all I needed to do was feel a little uncomfortable, a little at a time, and keep moving forward. Trust the process. Run one race run at a time. Run one mile at a time. In less than 9 months I went from never having trained for a race to increasing my mileage and finishing my first half marathon. I had butterflies in my stomach getting to the start line on the day of the Long Branch Half, but once I got in the corral and looked around at all the runners I had this amazing sense of accomplishment and pride. I thought this was the hardest thing I ever did: getting to that start line after wrestling with self-doubt and fear. I made it to the start line and got to the finish line, too, and no one can ever take those accomplishments away from me. So if you are lacing up for the first time to train for your first half marathon, or first marathon, remember the stories and life experiences that got you here. Embrace them because chances are they made you a runner. Thinking about them may make you feel a little uncomfortable but after all, if we all want to get to the next level we need to feel just a little uncomfortable. When you step into that corral, remember, no one can ever take that away from you either. You did it all yourself and you not only trusted the process along the way, but you also learned to trust yourself. The woman in the picture? “I began running about 10 years ago and never dreamed I would run a marathon. I have run two and the New Jersey shore has always been the backdrop. Looking out over the ocean as I finished was always a source of calm, strength, and inspiration. My first race was the Asbury Park Marathon 2010 and the second was The New Jersey Marathon 2011. The NJM was my fastest time to date and soon after it ended I began planning for my next marathon and a faster finish still. However, six weeks after my marathon pictured above, I was diagnosed with breast cancer. I was only 32 years old. I had been following a lump for six months and testing revealed it to be malignant. It was the last thing I ever expected. I was the mother of three small children ages 4, 6, and 7, a wife, and a fitness instructor. Instead of getting back onto the road to begin running again, I underwent a double mastectomy and then chemotherapy. I worked through most of my chemotherapy but was unable to do any serious running. When the time to train for The New Jersey Marathon in 2012 came around, I found my lungs would not take me more than a few miles. I was told my chemotherapy regimen could particularly affect the lungs. So, I took the year off but knew I would be back to race another day. What an inspiration Melissa is, and we are very glad that she, and her husband Nick, will return to race with us on May 5th! Please feel free to leave a comment for Melissa, and for others. Do you have a story of adversity overcome? 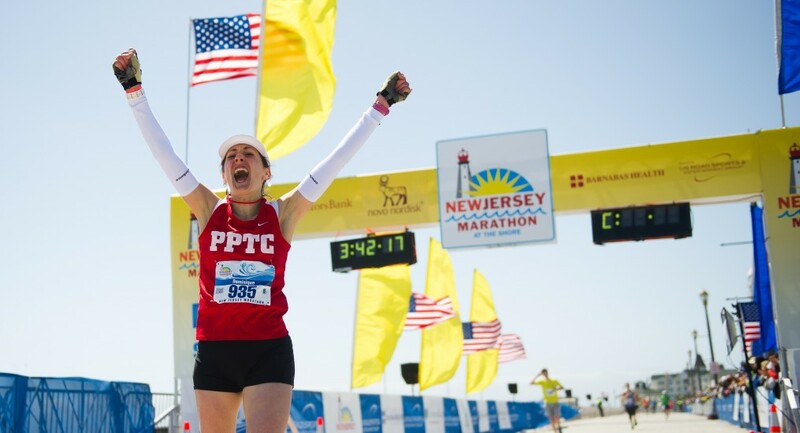 Tell us about your story here or send details to Stories@NJMarathon.org.